Misbaha Condition : 100% NEW. 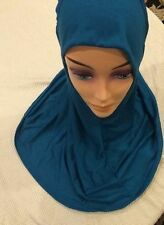 Misbaha Quantity : 1 pcs. Misbaha Color : As Appear In The Picture. Misbaha Weight : (Approx.). = 25 - 50 gm. Light up Indoor Decoration Moon (Hilal)– Ramadan Kareem Decoration,Batteries operated # 217 3. 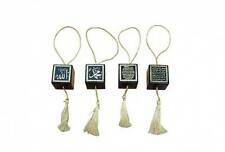 Light up Hilal that can be hung on the wall, the window or even from the ceiling. It is battery operated and made from white & brown wood. Material : Nature Agate. But the color and brightness may differ a little for the difference of shooting facilities, computer display screens or other factors. Your understanding is so appreciated. 1 x Prayer Rug (Random Pattern. Material: Polyester. We will try our best to reduce the risk of the custom duties. Color: As the pictures. We will do our best to help you to resolve your problems. Size: 110cm 70cm. ). 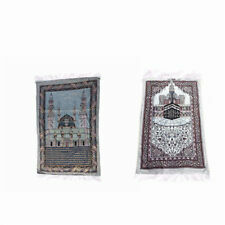 70x110cm Muslim Prayer Rug Prayer Carpet Mat Salat Namaz Islamic Arabian Style. 1x Prayer Rug. Pattern:flower, grass, palace. Material: polyester. 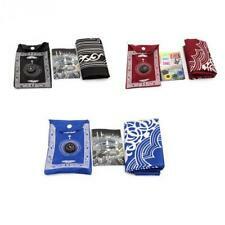 Dust cleaning, Easy To Clean, can be directly washed by washing machine or hands, not shed and fade. Material : Resin. (Approximate). Color : (as picture). 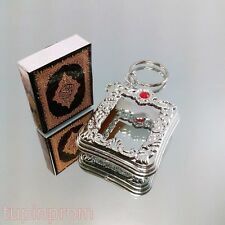 Mini Koran pendant design keychain, very retro and unique. 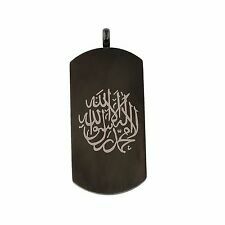 Features: Mini Size, Koran Pendant, Bag Decor. Type: Keychain. 1 x Keychain(Others Not Included). Ideal for bag, car, purse decor. Material: Plastic&Paper. 1 x Prayer Beads Engraved Allah Prayer Rosary（RANDOM COLOR）. Beads Quantity :99 Pieces. We will do our best to help you to resolve your problems. We will try our best to reduce the risk of the custom duties. Material : REAL Red Agate Stone. Colour : As the pictures show. Natural Stone Jewellery. But the color and brightness may differ a little for the difference of shooting facilities, computer display screens or other factors. Amazing Misbaha Color. Stone Color / White, Brown and Yellow. Condition very good, this is a lovely item to own or to give as a special gift. In any case, if you are not satisfied with the product. You Are Buying A Handmade Agate 8 mm Gemstone Beads Rosary. First quality Agate stone used in this product. BEADS SIZE 8 MM. ANTIQUE OTTOMAN ISLAMIC 25” SILVER INLAY BRASS TRAY HAND ENGRAVED w/SULTAN TUGHRA CALLIGRAPHY - IMPORTANT & RARE. Exceptional design and artwork. Hand engraved with Arabic texts, Islamic patterns and a thick silver inlay Sultan tughra monogram as a centerpiece surrounded by copper inlay vines. THIS IS QUITE A LOVELY CA. 1920’S QURAN STORAGE BOX NECKLACE. THIS IS A FINELY MADE EARLY 20TH CENTURY HAND TOOLED AND ENGRAVED BOX / PENDANT. THE PIECE IS BEAUTIFUL AND FINELY MADE OF HEAVY SILVER. واتصل بنا أكثر من 100 شخص طلب منها واعتذرنا ودفع البعض اضعاف السعر واعتذرنا. Paste link into a browser window:[isdntekvideo]. Video will open in a new window. الخاتم السليماني الأصلي من مركز روح الأحجار - YouTube. (THIS IS QUITE AN IMPRESSIVE CA. 1920’S QURAN STORAGE BOX NECKLACE FROM THE BERBER TRIBE IN MOROCCO. THIS IS A FINELY MADE EARLY 20TH CENTURY HAND TOOLED AND ENGRAVED BOX / PENDANT. MOST NOTICEABLY ON THE BOTTOM ). BAKELITE 100%. made of bakelite wood and cork. Luxurious Green Velur Prayer Rug. You can use it or give it as a special gift to your relatives. 330gr total weight. NICE - ANTIQUE - SILVER - ISLAMIC PRAYER BOX / KORAN SCROLL - CONTAINER - BROOCH / AMULET. Walking stick handle. total weight. Amazing Misbaha Brown Color. Stone Color /Brown. Condition very good, this is a lovely item to own or to give as a special gift. In any case, if you are not satisfied with the product. Special Design Nursefa Prayer Rug - Orange. WIDTH 68 CM. 4- ارسال اسم ومعلومات وتفاصيل المشتري لجميع المنتديات والبائعين والمواقع التي تتعامل او تتعاون معنا على الايباي وكافه المواقع الأخرى بأكثر من (20 موقع ومنتدى وبائع) ليتم التعرف عليه وحجبه وعدم التعامل معه. Antique 1800 brass or bronze astrolabe decorated graved RARE ! (réf : Astrolabe hebraique 0707). 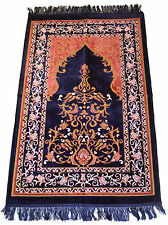 • A beautiful, standard adult size velvet Islamic prayer rug! • Thickness: This rug is thinner than most of our velvet prayer rugs, but has a durable backing, making it thicker than woven mats. Panel in a nastaliq script on a wooden base. It has beautiful detail all around it. This is a magnificent old and rare marble. WORLD'S FINEST ANTIQUES. ISLAMIC KALMA. FULLY BRASS MADE. CHECK ALL PICTURES FOR CONDITION. This is a Beautiful Islamic Copper Tray. Hand Engraved. Heavy for it’s Size. Back f or Wall Hanging. Rosary is siting of beads. Rosary contains a group of beads on a string. A gift for a family or for the friend. Size Beads: 5 Mm. Material: Rubber thread and plastic beads. In any case if. Color: (As the pictures show). Islamic Umayyad Ring with ALLAH legend seal. Jund Filastin 8 century AD. If you receive an item you. If you should do this, be certain to use. LATE 18THTO EARLY 19TH CENTURY ISLAMIC, THREE PART QUR'AN BOX AND PRAYERS HOLDERS. BASED ON MY BEST KNOWLEDGE THIS WOULD HAVE BEEN ORIGINALLY USED AS A BAZUBAND (ARM AMULET) AND OFTEN WAS USED TO PROTECT TRAVELERS. ISLAMIC Gulabdani. FULLY BRASS MADE. CHECK ALL PICTURES SIZE. ISLAMIC HAND. FULLY BRASS MADE. CHECK ALL PICTURES FOR CONDITION. WEIGHT: APPROX 1.750 KILO. Decorated at the side too withARABIC letters.Very heavy. ONLY TO COUNTRIES THAT.